Are you ready for an exciting one-on-one fight with a trophy big game predatory fish you can talk about for years to come? 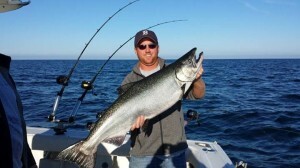 Looking for a chance to catch a giant Coho, Lake Trout, Steelhead or King Salmon like the one pictured below? on beautiful Lake Michigan for a Trophy Lake Trout, Steelhead, or King Salmon!!! Saugatuck is the home port for MIRYHA (pronounced Mariah) and is one of those hidden treasures of Lake Michigan, offering World Class Brown Trout, Lake Trout, Steelhead, Coho and King Salmon Sportfishing. We value creating an exceptional and memorable experience for all our guests. 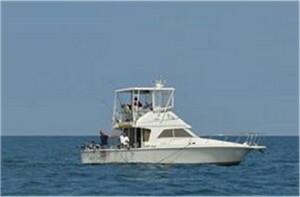 From Family Sportfishing outings to Charter fishing adventures with business colleagues – we aim to please. Being the largest boat in the Saugatuck and Holland area allows us to provide a spacious fishing platform for large groups of up to six people. Captain Mike’s 18 years of Sportfishing experience working the Saugatuck and Holland waters helps him find the elusive Salmonoids even when the fishing gets tough. Over the last few years we have been excited about the trophy size Lake Trout we have been catching. The Lake Trout is a native fish to Lake Michigan and is an excellent Sportfishing predator similar to the King Salmon we have all grown to enjoy. 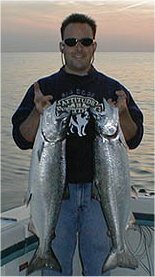 The unique structure south of the Saugatuck and Holland area is an excellent Lake Trout fishery. Come out and enjoy some of the best Lake Trout, Steelhead, and King Salmon fishing Lake Michigan has to offer.